Willis Newson worked with Brunelcare, a provider of high quality housing, care and support for older people in the South West, to devise and deliver a public art plan for their new Saffron Gardens development in Bristol. The new building also functions as Brunelcare’s new Headquarters. 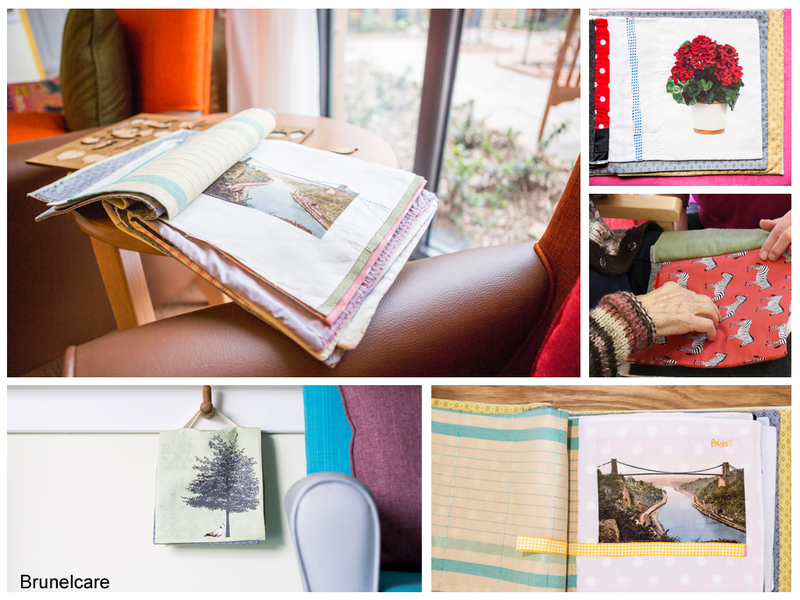 Together we created an arts programme that will help Saffron Gardens to be an exemplary environment for dementia care, supporting the health and well-being of residents and staff. Our work was informed by consultation with management, staff, residents and visitors of the existing care home. It included commissions for specific areas within the building and an artist residency. Two artists, Deirdre Nelson and Eamon O’Kane worked on the project, to create artworks to stimulate the creativity of those who would be living in the new building and also to explore ideas about the meaning of home. The artists researched the needs of residents to inform the design of artworks to support their wellbeing. Both artists focused on the need for stimulation and created artworks that facilitate and encourage creative activity. Eamon O’Kane created an interactive commission – Creative Toolboxes – for the new Saffron Gardens care home. “My project for the interactive commission was to construct four purpose-built movable wooden cabinets, one for each residential unit. 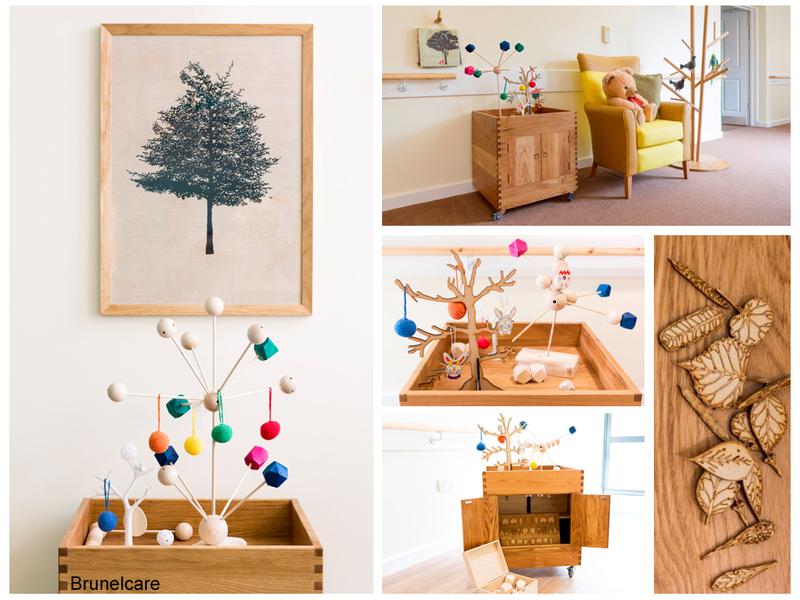 The cabinets contain a series of abstract and figurative wooden and woolen objects inspired by research into dementia and dialogue with staff and residents. Staff and residents can work with these multidimensional objects on the tops of the cabinets or the items can be constructed into mobiles for display in resident’s rooms or elsewhere in the building. The cabinets also contain audio playing equipment, which connect wirelessly with headphones and speakers, enabling residents to listen to music, poetry, ambient sounds and audio books." said Eamon. Deirdre Nelson created a project called ‘Home’. "I spent a week as artist in residence at the old care home, Saffron House, spending time with residents and involving myself with daily activities and sharing conversations with those working and living there. One of the things I noticed was how important cloth was in the daily lives of residents." Exploration of visual and tactile stimulus lead to the development of fabric ‘sample’ books and a migratory flock of textile birds. Both of these can travel throughout the space with residents, or be held and touched by those residents who are less mobile. The flock of birds has been created using soft natural yarns (silk, cotton, angora and wool) and embroidered to provide detail and additional tactile surfaces. The birds chosen relate to birds from Jamaica, Punjab, Somalia and many other countries relevant to the residents in the Bristol home. "Throughout my time at Saffron House I observed residents interacting with objects, clothes and hats and a traditional hat stand in a hallway. Each unit within the new Saffron Gardens development was to be named after a tree and so, in collaboration with Helen Kalmijn, I developed ideas for a series of tree hat stands. 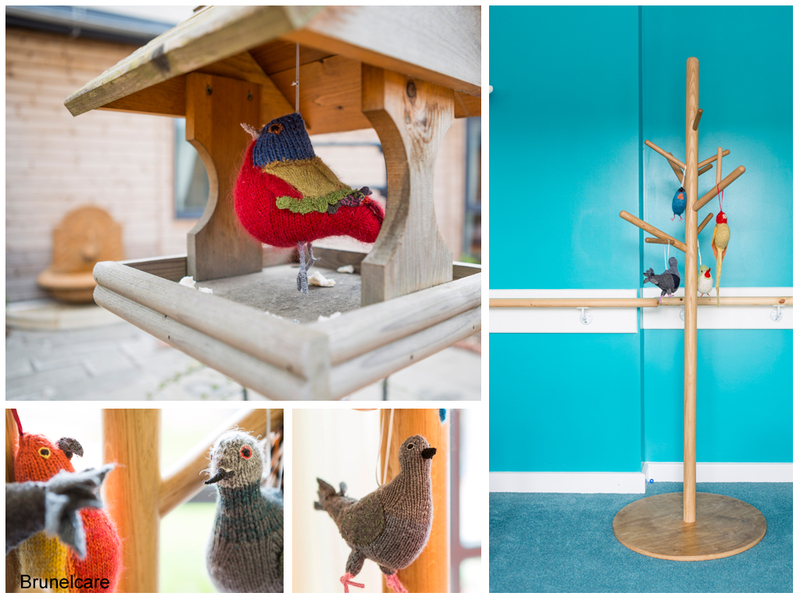 These act as a prompt from inside to outside and are both a sculptural and a useful addition to the home, allowing residents to hang clothes and objects.” Said Deirdre. From this commission the Napkin Project evolved, find out more here.